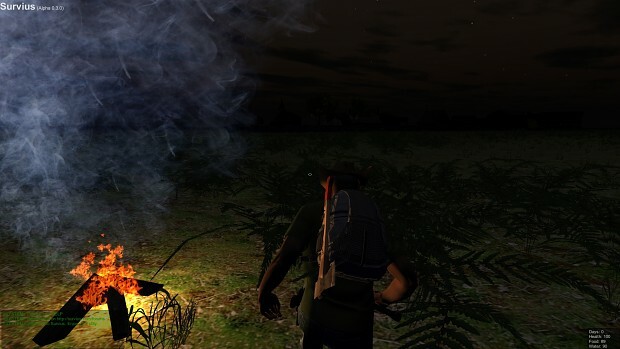 Version 0.3 of the Open-World Zombie Survival game Survius is out now. It has a lot of new features and all netcode was rewritten to ensure stability. Version 0.3 of the Open-World Zombie Survival game Survius is out now. It has a lot of cool new features and all netcode was rewritten to ensure stability. The best way to show the current state of the game is by showing gameplay, so I've compiled a new video with a compilation of the footage I shot while playing the game the past week. The crafting system has gotten a well needed overhaul. It now shows you a preview of what you are going to craft, and also shows you if the location you have selected is valid for it. This fixes the building of campfires inside walls, floating tents and other crafting related bugs. The code that handles the network-part of the game has been completely rewritten and optimized. Survius has 4 rooms that you can join, all capable of connecting 25 players. I have configured 2 of these rooms for the US region. From the Server Browser you can now switch between the EU region and US region. This should give player in the US region a significantly lower ping, and therefor smoother game experience. Campfires now give off smoke. This should make them easier to spot, and that creates a higher risk of detection. The new crafting system makes it impossible to start fires indoors. This game tries focus on survival rather than killing on sight. From the first versions on this game has a surrender move. This means that if you find yourself cornered or outnumbered, you can surrender. 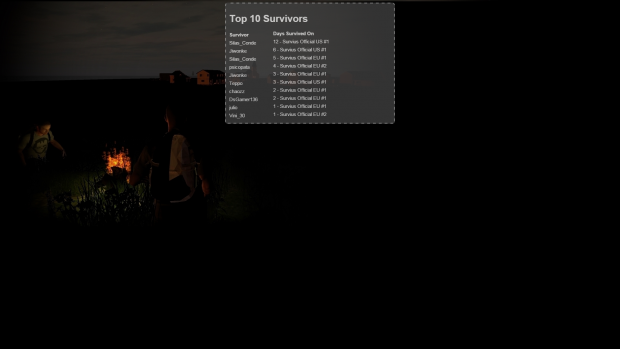 To further promote survival instead of killing I've added a Top 10 Survivors to the website, showing the number of days a player has survived. I added two new zombie models, each with their own special drops. Cop zombies, that can drop guns and ammo and a hospital patient zombie that can drop medical supplies. Killing an animal didn’t change, but they will no longer randomly drop raw_meat on the floor. 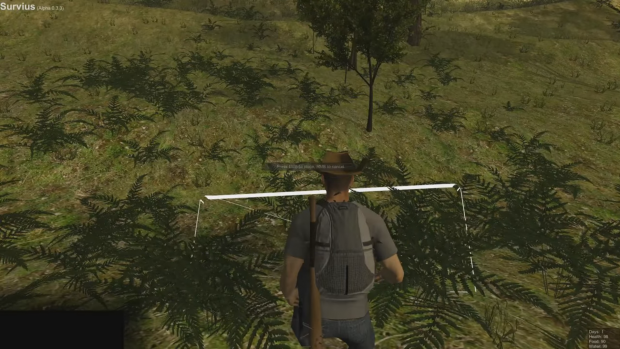 You need to have a machete in your backpack to be able to gather meat from a dead animal. Hunting knifes can be found at the normal weapon spawns. I have reduces the grass detail count, so people with slower pc’s should have a smoother experience. Selecting one of the two lowest graphical settings will disable grass altogether. I have also lowered the entire vertical terrain deformation by 33%. This makes the mountains less steep, and just feels and looks so much better overall! Download the game from the homepage. Check our Steam Community page.